The experts on Off-Broadway musical comedies with cocktails at "The Imbible" serve up the history and social importance of holiday drinks with the return of their holiday show "Christmas Carol Cocktails." All performances include three complimentary holiday drinks, and run Friday, November 17th through Saturday, December 30th at Roy Arias 777 Theatre, 777 Eighth Avenue between 47th and 48th Streets. 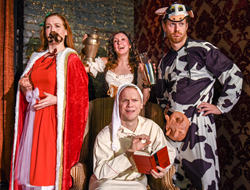 The award-winning team behind the long-running Off-Broadway smash-hit "The Imbible: A Spirited History of Drinking" takes on Dickens in their holiday installment of music, comedy, and cocktails, "Christmas Carol Cocktails." Three complimentary holiday drinks are included. It’s the morning after Scrooge’s spectral visits, and our hero is determined to celebrate Christmas by throwing a party “just like old Fezziwig.” However, he realizes he has no idea how to go about the thing, and the libations prove particularly puzzling. Summoning Marley back for some additional help, they depart on another trip through time and space, this time with acapella accompaniment, to mix cocktails past, present, and future under the expert tutelage of three Christmas Spirits. Discover the stories behind our most cherished holiday beverages of days-gone-by, sample cutting-edge cocktails of holidays yet-to-come - including frozen rose and red wine made using liquid nitrogen live on stage - and learn how to create today’s hottest drinks for your very own seasonal celebrations. "The Imbible" shows have been hailed as “remarkably compelling” by Time Out New York and “an absolute must-see” by The Huffington Post. "Christmas Carol Cocktails" has quickly become a favorite holiday tradition, treating audiences to a completely original and thoroughly enjoyable evening of theatre utterly unlike anything they’ve ever experienced! Guests leave satiated, educated, entertained, and buzzing with holiday spirit. The cast of "Christmas Carol Cocktails" features Nicole DiMattei, Kate Hoover, Connor Bezeredi, and Stephen Scott Stark, with book by Anthony Caporale and musical arrangements by Josh Ehrlich. Anthony Caporale (Producer) is the Director of Beverage Studies for the Culinary Management Program at New York City’s award-winning Institute of Culinary Education and a true pioneer in the beverage world, internationally known for being the first to bring mixology to YouTube, with his seminal web video series "Art of the Drink TV." He has also served as the U.S. Brand Ambassador for Drambuie Scotch Liqueur, the U.S. Cocktail Ambassador for Truvia Natural Sweetener, and the Managing Editor of Chilled Magazine, one of the leading trade publications for cocktails and spirits. He is also the creator and host of "Broadway Bartender," a weekly web series featuring interviews with actors, bartenders, and personalities from New York's Theatre District that gives a behind-the-scenes look at what it's like to live, work, and play on Broadway. Performances of "Christmas Carol Cocktails" are 8pm Mondays, Thursdays and Fridays at 8pm, and 5pm and 8pm Saturdays (additional performances are 8pm December 26th and 27th). Tickets range from $79 to $99 and can be purchased by calling 866-811-4111 or visiting Ovationtix.com. Roy Arias 777 Theatre is located at 777 Eighth Avenue between 47th and 48th Streets. "The Best of NYC's Holiday Theatre"
"Takes holiday cheer to a new level." "One of the best holiday offerings to be found this year in NYC."